The Raising Cane’s River Center will once again magically transform the arena into a “Winter Wonderland” just in time for you to create your holiday memories. 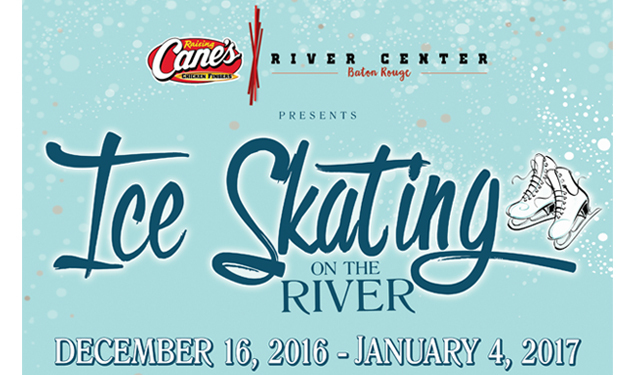 The Raising Cane’s River Center presents Ice Skating on the River, a holiday tradition, which will kick off the ice skating season on Friday, December 16, 2016 with an Opening Night session sponsored by WAFB. For one night only, the Coca-Cola Santa Truck will be at the Baton Rouge River Center, spreading the joy of the season. If you’d like the opportunity to spread the joy of the season, the Raising Cane’s River Center will be accepting unwrapped gifts, during opening weekend, for the National Guard’s Christmas Angel program, benefiting local families in need. Party Packages and Group Rates available! Call 225-389-3030.